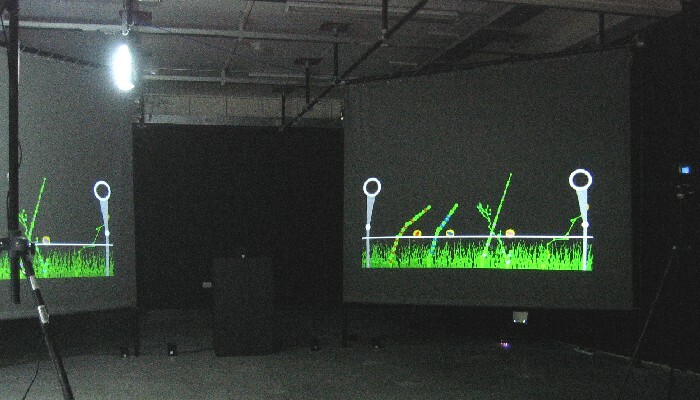 Mendel/Jungalist is an interactive double act in sound and vision exhbited at the University of East London for the 3rd year degree show. 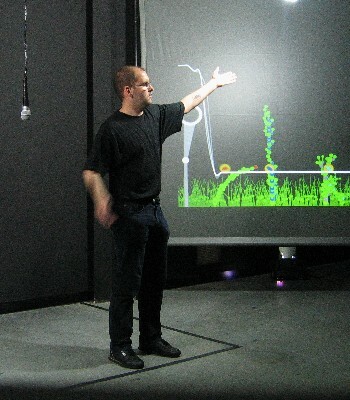 Mendel is a Processing installation that shows 5 L-System plants. 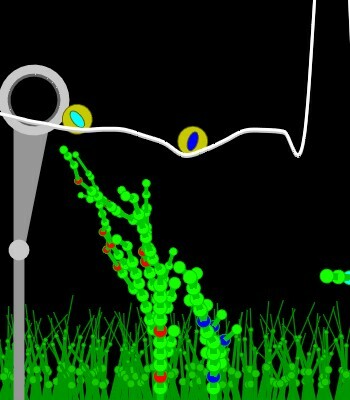 By means of a rope manipulated by interaction with a video-camera the fruit of these trees are fed into hoppers and the genetic code from two trees will generate a new cross-breed from the parent trees. The parent trees are stamped on to the background to create a jungle. Launch Mendel demonstration. The original code features a PDF export option allowing you to create a vector file of your favourite trees as well as using your webcam to play with the visual-tracking rope. Download exhibit code archive. Jungalist is a Pure Data installation of ambient random noise. A rhythmic heart beat and breathing is a constant whilst random jungle animals can be heard. Making noise into the installation microphone prompts the jungle's animals to cry out immediately. Rather like Bjork's Medula album the noises were all created by voice actors (Sarma Krumins, Stuart Robinson, Lindsay Segal, Gerry Grainger and myself). To operate Jungalist on your computer open jungalist.pd, hit the [bang] labeled start and turn the volume up to about 80 decibels on the [output~] subpatch. Download Jungalist Archive (warning, 5mb size, contains sound files).